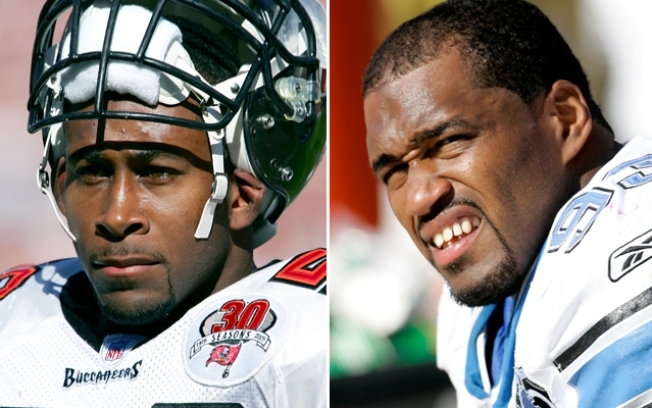 Former NFL teammates Marquis Cooper, of the Oakland Raiders, and Detroit Lion Corey Smith disappeared off the coast of Florida on Feb. 28. TAMPA, Fla. — Two NFL players may have died just a few hours after their fishing boat capsized in rough seas and possibly before rescuers were even alerted that they and two others were lost off the west coast of Florida, according to Coast Guard records. The Coast Guard report, which redacts the men's names, says the group went roughly 70 miles — or 62 nautical miles — to fish for amberjack. Besides the 24-year-old Schuyler, also aboard the 21-foot Everglades boat were Oakland Raiders linebacker Marquis Cooper, free-agent NFL defensive lineman Corey Smith, who played for the Detroit Lions last season, and former University of South Florida player William Bleakley. The bodies of Cooper, Smith and Bleakley have not been recovered. Records document the Coast Guard's repeated attempts — and frustrations — as rescuers tried to find the small white boat in a stormy sea with heavy cloud cover and whitecaps making it tough to spot.